In a study of perseverance and determination, Bob and Ellen Thompson outlasted labor unions and built up one of the most successful charter school operations in the nation. In 2003, when former Gov. Jennifer Granholm and Detroit city officials, in lock step with local and state teachers unions, snubbed Bob and Ellen Thompson’s gift of $200 million to build charter schools in the city, the couple from Plymouth found themselves staring at a vast abyss. The refusal of the offer by a cash-strapped city, burdened by a dysfunctional and underperforming school system, made Detroit the target of national news stories ridiculing local incompetency. Critics from coast to coast skewered Granholm and then Detroit Mayor Kwame Kilpatrick, along with their respective administrations, for caving to opposition of charter schools by the Detroit Federation of Teachers and the Michigan Education Association, among other labor unions. After union members staged a rally in Lansing in 2003, Kilpatrick and Granholm turned down the Thompsons’ offer in spite of the fact that, earlier, they had welcomed it with open arms. The political controversy and the fallout the offer ignited was bewildering to the humble, unassuming couple. Only a few years earlier, they had been widely acclaimed when another example of their generosity came to light. In 1999, Bob Thompson, who owned Michigan’s largest asphalt road-building business, Thompson-McCully Co. in Belleville, sold his holdings to a firm from Ireland for $422 million. He then informed his 550 workers of the sale by letter, and spelled out a special caveat for each of them. Not only would they keep their jobs, but the Thompsons would share the windfall with all of them. The couple set aside $128 million after taxes for bonuses for their employees. The 80 workers with the most seniority became instant millionaires. They received awards of between $1 million and $2 million each. Hourly workers received $2,000 for each year worked. Today, their dream of boosting Detroit by educating its children is alive and flourishing as more than 4,000 students answer class bells each morning in nine charter schools operating from three different campuses, all funded by the Thompson Education Foundation. 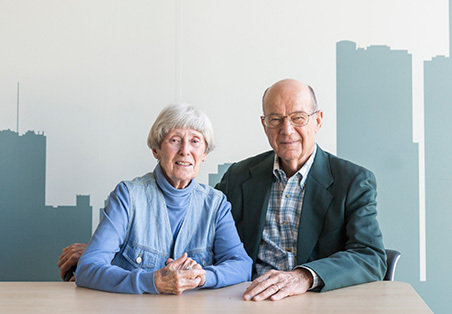 Since 2007, the couple has poured more than $126 million into new buildings, retrofitted historic old ones, installed high-speed Internet lines, and outfitted classrooms with equipment and furniture, with more to come. The foundation has plans for two more elementary schools, and Thompson says he envisions adding at least two more K-12 schools within the next three to five years. Another $100 million was set aside so the foundation could underwrite the charter schools. The Thompsons aren’t alone. Among those who reached out to the couple following the rebuke from the unions and politicians were Ed Parks, a retired partner at Plante Moran, a large certified public accounting and business advisory firm in Southfield, and Doug Ross, a former candidate for Michigan governor and U.S. assistant secretary of labor in the Clinton administration. Bing, who shares the Thompsons’ aspirations for young people in Detroit, says he was stunned by the union furor and political maneuvering that immediately followed the couple’s $200 million offer. The model for that school was already in place. Ross founded the original University Prep Academy in 2000 with 112 students. Thompson was attracted to the school’s “90/90” pledge that promised a 90 percent graduation rate with 90 percent admission to college. Although Thompson is a Republican, he says he was open-minded to working with Ross, a Democrat. He believed Ross would put politics aside for the greater good of helping students in Detroit achieve a better future for themselves. Ross replied that if his students don’t show up for school, he would go to their home and get them. “Well, right away I knew this was my guy,” Thompson says. In addition to providing funding for Ross’ school, the pair spawned the funding of eight other Thompson Foundation schools. And Ross’ 90/90 goal for student performance is still the cardinal goal. Thompson says during the three-month enrollment period for new students each winter, the schools do not cherry-pick the applicants. “We aren’t just picking the cream. On average, 11 percent of the students are (academically) challenged,” he says. In addition to accepting applications, the schools round out annual enrollment with a lottery. Overall, there are 220 teachers working on the three campuses. Each teacher buys into the mission of creating a family-like situation with his or her students, and class sizes are purposely kept low to encourage one-on-one interaction (16 younger students per classroom and 22 students in the upper grades). Bob says he and his wife are not involved with the administration of the schools, and they don’t back charter schools to make money. He points out that he collects $11 a year for rent on the buildings, and is content to build and outfit the schools and turn them over to professionals. “One thing I learned in life is you have to figure out who you are and who you are not,” he says in explaining why he is not a hands-on landlord. The Thompson educational blitz is not limited to charter schools in Detroit. They also established hundreds of scholarships for students at Schoolcraft College in Livonia, Michigan Technological University in Houghton, Michigan State University in East Lansing, and Bowling Green State University in Ohio. As the Detroit schools gained their footing, the successful educational model began to attract people like Mark Ornstein, an educator with a law degree, who was recruited two years ago from the Philadelphia School District to serve as CEO of the Thompson schools. Ornstein says operating public charter schools poses financial challenges. The budget for the Thompson schools this year is $16.1 million. While charter schools do not get local funding, they do receive a $7,350 per pupil allocation from the state. That compares with an overall public school contribution of $12,000 to $14,000 per pupil for students living in more affluent school districts like Troy or Rochester. 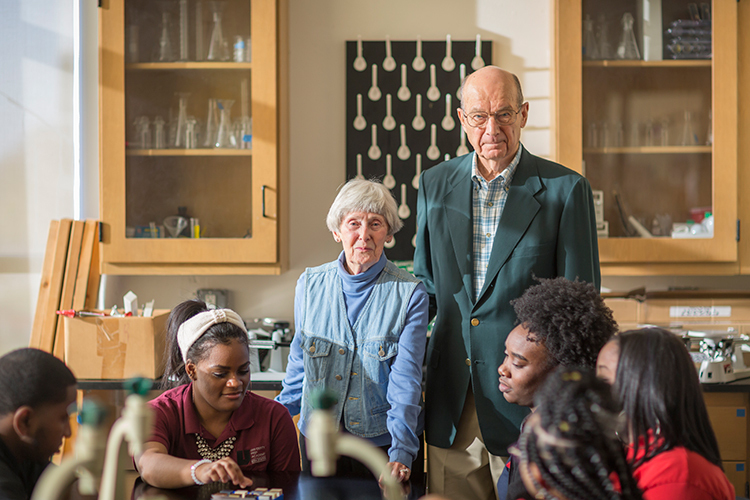 For the Thompsons, who celebrated their 60th wedding anniversary in 2015, the progress of the University Prep schools is the culmination of a partnership that began in the 1950s when they met as students at Bowling Green University. Upon graduation in 1956, Bob entered the U.S. Air Force and was commissioned as a lieutenant and trained to fly the prestigious F-86 Sabre fighter jet. The Korean War had ended and the Vietnam conflict was off in the future. “It was a terrific time in our lives,” he says of the three years he was based in Sioux City, Iowa, assigned to the Air Defense Command. During college, Thompson worked on a road construction crew. After his discharge from the Air Force, he used $3,500 Ellen had saved from teaching to start a road-paving business with his uncle, Wilfred McCully. The partnership didn’t last long, Bob recalls, given McCully wasn’t inclined to take the same kind of aggressive risks as the one-time jet fighter pilot. Bob says they mortgaged their home six or eight times without worrying about losing the house. He went from a job paving a small section of a street to negotiating with Wayne County and landing a contract to pave a runway at Detroit Metropolitan Airport in Romulus. “Whatever business you’re in, you have to move aggressively,” he says. A chance early morning breakfast meeting with a stranger in Plymouth served to propel the business through thick and thin, he says. Because he was an early riser, he would quietly slip out of the house so he didn’t disturb his wife, and had breakfast at a downtown dime store on the corner of Main and Ann Arbor Trail. Another early bird who frequented the diner was Floyd Karror. After a while, the men took notice of each other, exchanged greetings, and began having breakfast together every day. That pattern went on for a year. They made small talk; sometimes it was about farmers, a subject Thompson was intimately familiar with, and sometimes it was about small-business people, whom Karror especially admired. When Thompson needed to borrow $200,000 to expand his company, he went to the Plymouth Bank and was ushered into the owner’s office. He was surprised to see Karror sitting behind the desk. “At first he said he couldn’t lend me that much money, but then he went out and came back with four certificates, each for $50,000. He told me to go home and have the family sign them.” Thompson’s family at the time consisted of two infant boys and Ellen. With their signatures, and two Xs Bob and Ellen signed for the boys, Thompson got the money. Karror would later sell the bank to the National Bank of Detroit, but continued to run the facility in Plymouth. As the company expanded, it grew into the largest asphalt road-paving operation in Michigan. “We built I-94 and I-275, and eventually we were doing about 68 percent of Michigan roads, from Flint across to Lansing,” he says. By 1999, Thompson-McCully owned eight asphalt plants, a limestone quarry, and its own asphalt cement storage facility. Two of the plants were in Grand Rapids; there was one each in Kalamazoo, Jackson, and Lansing; and there were three in metro Detroit. The Thompsons visit the UPA High School on St. Antoinette in November. They say competition for skilled teachers is one of the challenges they have in staffing the schools, especially math and science teachers. Ellen says after 67 years of working six days a week, Bob, at age 83, is cutting back. He gave up working on Saturdays. The couple has three children — John, David, and Anna; six grandchildren; and one great-grandchild. Bing says the Thompsons have performed a great service to the city, and he commends the couple with seeing the larger picture.